BEIJING (Reuters) - Ford Motor Co. may build a new car plant in northern China after its three-way China car venture splits into two separate entities, a Chinese newspaper said on Wednesday. Ford, which makes cars in China with Mazda Motor Corp. and Chongqing Changan Automobile Co., operates two plants currently, one in the western municipality of Chongqing and another in the eastern city of Nanjing. But Ford and Mazda are seeking regulatory approval to split their venture into two 50-50 entities with Changan, respectively. After the split, the Nanjing plant, which currently makes Mazda 2, Mazda 3 and Ford's Fiesta compact cars, will belong to the Japanese automaker, the 21st Century Business Herald said, citing unnamed people. As such, Ford, which aims to sell 1.5 million vehicles annually in China and have an 8 percent market share by 2015, is considering building a new plant, possibly in the city of Tianjin in the north, it said. "Certainly we have ambitious plans to continue to grow China, the world's largest automotive market, just as we do for the rest of the growing markets in our Asia Pacific and Africa region. We have nothing to announce at this time, however," the Detroit automaker said in a statement. A Changan spokesman declined to comment. 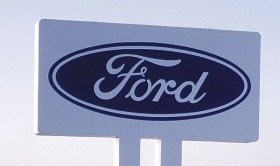 Ford is a relative late-comer to China. But it has been accelerating its expansion, building its third China car plant in Chongqing and its second plant with its partly owned Jiangling Motors Corp. in the southeastern province of Jiangxi. Ford sold 582,467 vehicles in China last year, with a 3.2 percent market share. Sales in January rose 20 percent year to 53,340 units.